SCI Recruitment for the following posts explains below in the post. All Indian fresher Candidates can apply for these Government jobs India. The Applications are invited from candidates who fulfill the following qualifications and other eligibility conditions as on 01 May 2018 for selection of suitable candidates for appointment to the post of Assistant Librarian in the Supreme Court Library which is placed in the Level 8 of Pay Matrix with initial basic pay of Rs. 47600/- plus other allowances as admissible under the rules in the Registry of the Supreme Court of India. Those who are willing to apply for these Government jobs must read this full post to know more about the application process. Degree in Library Science from a recognized University and Diploma in Computer Applications of a recognized university or Institute. Pay Examination fee through Demand Draft/Pay Order drawn in favor of Registrar (Admn. ), Supreme Court of India payable at New Delhi. 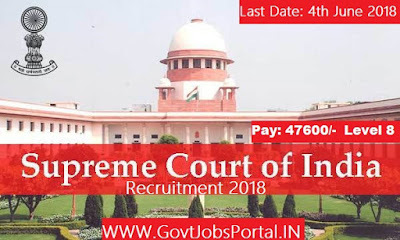 Supreme Court of India is going to conduct a written Test for the selection of the candidates. Those who cleared the first round of selection will go through the interview round for final appointment. 04 June 2018 is the Date of Interview.